Delancey Street Associates (DSA), a joint venture of BFC Partners, L+M Development Partners, Taconic Investment Partners, the Prusik Group and the Goldman Sachs Urban Investment Group, has secured $161 million in loans. The partnership refinanced The Rollins, a 16-story mixed-use building at the nine-site Essex Crossing on the Lower East Side. Both the largest Trader Joe’s on the eastern seaboard and a Target are open in the building, its 211 residences (including 107 market-rate units) are nearly fully occupied eight months after leasing launched, and its adjacent public park is expected to open by next spring. DSA closed on two refinancings Monday: a $93 million loan from Wells Fargo for the building’s residential component and a $68 million loan through Goldman Sachs’ Commercial Mortgage Backed Securities group for the commercial portion of the building. Fannie Mae administered the residential refinancing. At the same time, DSA has signed a 4,000 s/f lease with Spectrum to take a portion of ground floor retail space in The Rollins. Jonathan Schwartz, Mark A. Fisher and Sean Bastian of JLL Capital Markets represented DSA on the commercial refinancing along with partners Aaron Appel, Keith Kurland and Adam Schwartz. “Wells Fargo has been deeply committed to supporting Essex Crossing through its stages of development, and it is thrilling to see the residential, commercial and community-oriented aspects of the project coming to life,” said Alan Wiener, head of Multifamily Capital for Wells Fargo. 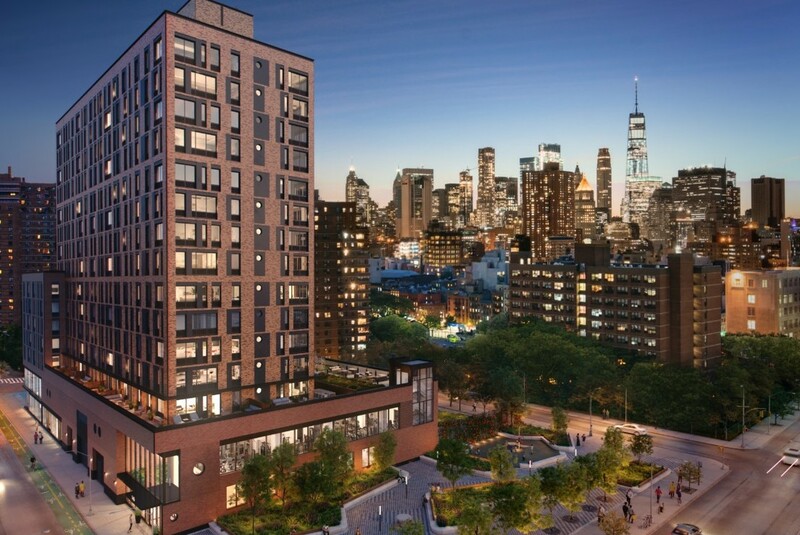 With roughly 90 percent of Essex Crossing now open or under construction and 90 percent of its financing secured, the 1.9 million square foot project is coming to life with its first residents. Seven of its nine sites are now open or under construction. In addition to The Rollins, sales have supassed 75 percent at 242 Broome, a 55-unit luxury condo that welcomed its first residents earlier this year. Designed by SHoP Architects, 242 Broome will also house the new home of the International Center of Photography and The Gutter bowling alley, both of which are expected to open next year. And leasing is expected to begin later this year for 98 market rate residences at The Essex, a 26-story building at 125 Delancey Street that will also house a 14-screen Regal Cinemas, the new home of the historic Essex Street Market and phase one of the Market Line, a marketplace spanning 700 feet along Broome Street at the base of three new Essex Crossing buildings. Regal Cinemas is expected to open this winter and both the new Essex Street Market and first phase of the Market Line are expected to open by next spring. Essex Crossing comprises 1.9 million square feet of residential, commercial, and community space. The nine sites on six acres had sat mostly vacant since 1967 and represent one of the most significant urban renewal developments in the history of New York City. The project will include 1,079 units of housing upon completion.